Whenever I sit down to watch David Hoffman’s brilliant and still applicable documentary Riding for America: The Olympic Equestrian Team with other folks, I always have them pause the DVD at the point where we are beginning Phase A. In the YouTube clip (https://www.youtube.com/watch?v=IgPuXg75ISk&feature=youtu.be ), it is the opening scene. I feel it’s essential for people watching to understand what is taking place when The Gray Goose dances during the countdown and I begin to talk to him as we cross the Start Line upon the word “Go!”. I have always talked out loud with horses, feeling on an inner level that they understand far more of what we say and mean than science has yet proven. And my talking to horses this way has always had good results. When I got my first invitation to the United States Equestrian Team (USET) 3 Day Event Team Training Session, however, the formidable U.S. Coach from France, Jack Le Goff, made it very clear to me that he tolerated no voice other than his own during instruction. I felt very chagrined, and did my best to remember that silence was the rule here, as it was in those days professionally pretty much everywhere. That is, until the day Jack put me on a Team horse that had been traumatized when it came to jumps. If that horse even saw a standard or pole, he freaked out. 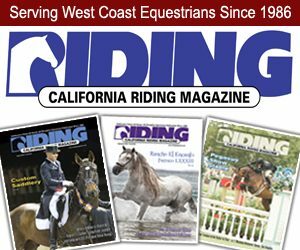 I had heard about this problem before I rode him, so I asked Jack’s permission to get on him early in order to understand him better before our class. Jack granted it, and I entered the indoor arena leading the horse around the jumps and talking to him in a peaceful way until he was calm. Then I mounted up and did the same. The horse began to relax and trust me. Unbeknownst to me, Jack had been watching from a hidden spot. 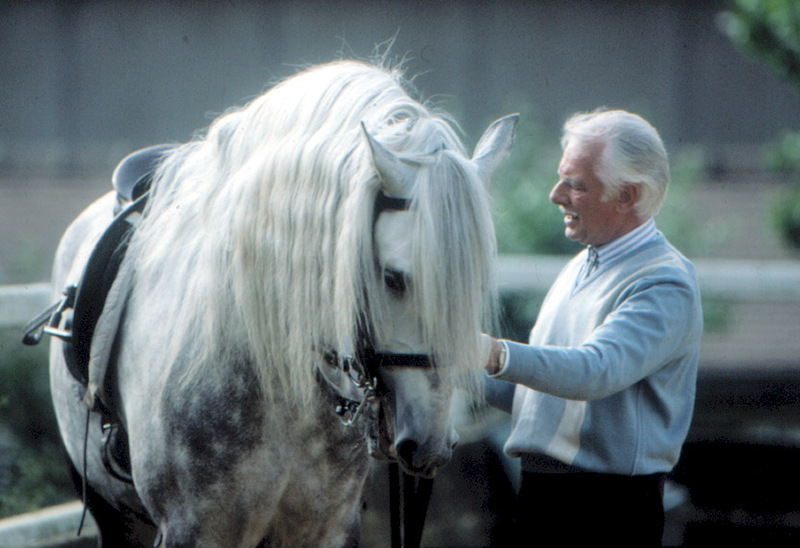 His coaching style might have been straight from Europe and very authoritarian, but like all truly great coaches, Jack had a keen sense of people as well as horses. And he was quite supportive of anything that worked for the best effect. When he entered the ring for our group session, he came over to me, and said, “Kim, you can speak to the horses whenever you like.” By the middle of the class, that horse was even willing to walk over some poles. And from that time forward, whenever Gray and I were entering the Cross Country start box at an international competition, Jack would quietly say to me, “Turn on your tape recorder, Mother Goose”, meaning start talking! In addition to my unconventional and from-the-horses-viewpoint training orientation, I did a lot of studying in books and magazines. I knew from my beginning days that time was a critical factor at Advanced and International competitions. Since my goal, should our talents prove to meet the requirements, was to make the US Eventing Team, I was always thinking in terms of what would serve us at that level. 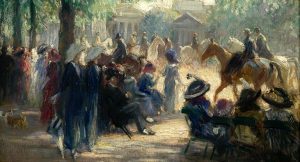 Knowing every second counted, I trained Gray to pay attention to a countdown, imitating the enunciation every starter uses, and to anticipate that the word “Go!” meant that I needed him to leap into an accelerating hand gallop. At the same time, I also trained him to stand as quietly as he could until he heard that word. I’d seen the leaping and plunging that overexcited horses tended to exhibit in the start box at the 1974 and 1978 World Championship competitions. 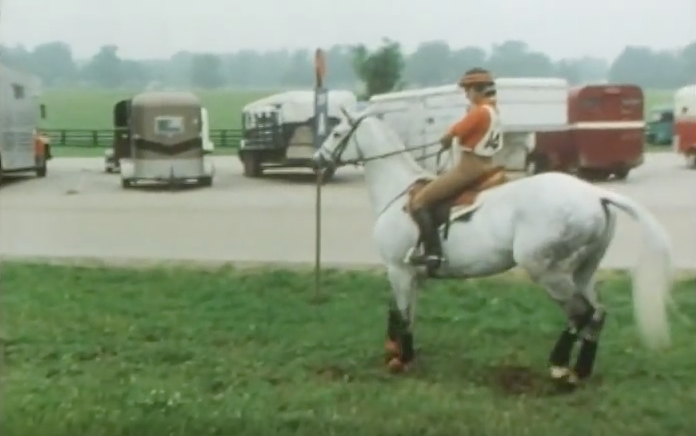 I didn’t want my horse to waste any energy before that all-important Phase D.
The Riding for America documentary was filmed at the 1982 Rolex National Championships in Lexington, KY. By that time, Gray and I had climbed the ranks and already had two trips to Europe under our belts, competing as members of the USET. He clearly knew the difference between a Horse Trial and a 3 Day Event. In a Horse Trial, he didn’t carry weight, and I put him over some warmup fences. At a 3 Day, we didn’t warm up over fences, and we started Roads and Tracks quietly. When I began riding Gray in Ireland and he belonged to the stable owners, he was not considered a very bright horse. Honestly, I didn’t think he was very smart either. However, as he began to trust me, and I learned how to ride so he could soften into our work and experience that it could actually be of benefit to him, his incredible intelligence began to show itself. It turned out that he was using his cleverness in defense of himself in those early days, and looking back, I couldn’t blame him. Once he bought into our partnership, people would often say “He has human eyes”. He knew exactly what we would be working on each day by the saddle on his back, and by the boots on his legs. He never forgot a venue or a course, and after the first year around a particular XC, he would often argue with me if they made changes the next season! In addition, he also learned that courses built with Jack Le Goff input tended to focus on particular questions, which would be introduced within the first 3 fences. After that, he’d be on special alert looking not only for the flags indicating each jump, but for that question as well. For example, the first year Rolex was run backwards, several of the jumps had a solid vertical face with a ditch hidden on the landing side. Jumped the original way, they were a version of Weldon’s Wall, and the ditch was in the front. After being initially confused in our approach to the first of these (I was asking him to jump it not like the vertical it seemed, but like an ascending oxer), I could feel his epiphany in midair. After that, on his own he went forward to every solid vertical on the course and jumped each of them easily. I tell this story to illustrate just how much Gray understood about the Game, and how canny he was about playing it. So, to get back to the sequence shot at the beginning of the documentary, Gray was particularly eager to get out on the course. He LOVED running at Kentucky…a sentiment I enthusiastically shared! As I walked him in circles waiting for our countdown, I could feel some anxiety coming from him…a questioning because our preparation that day was different. The Gray Goose knew me every bit as well as I knew him. He was quite aware that I could become distracted, and as I approached the flags marking the start line, I could feel him asking me if perhaps I forgot to warm him up more? After all, I had told him all the details of the course, yet we hadn’t trotted at all or cantered. I knew, of course, that we had a very long way to go on that very humid and hard-to-breathe day, and every step would count. He would warm up fine along the path of the six miles we had to cover before the two miles of Steeplechase, but I had neglected to inform him of this change in our normal routine. He, in his infinite wisdom, decided that he should hightail it off the mark when the starter said “Go!” just in case this was indeed Cross Country. He tossed his head and lunged forward in a couple of hopping canter steps. In the film you can hear me calmly telling him to “Just trot, Gray, it’s Roads and Tracks”. I asked–he delivered instantly. In a heartbeat he settled right down and hit his ground-covering trot rhythm on a loose rein. 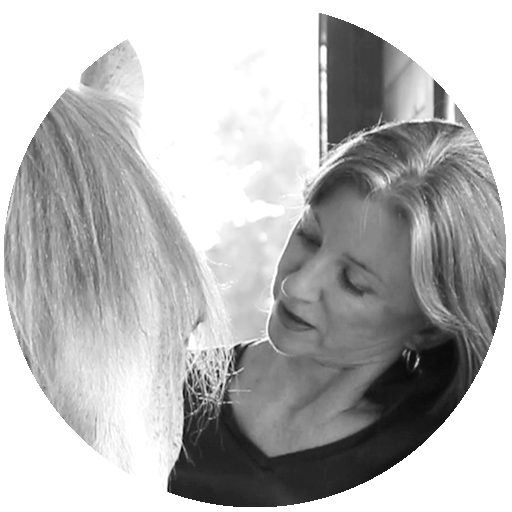 How wonderful it is to nurture that mutual trust with a horse…to listen to their input and develop reciprocal understanding so that they are joined with you in accomplishing a task. To me, there’s no better feeling than that combination of bodies, souls, and thoughts, moving forward toward a common goal with joint focus and joy. Another fabulous Kim Walnes article, Kip – thanks for the idea and for posting!